Annihilation is a lousy title for anything. I know writer/director Alex Garland was working from a novel by Jeff VanderMeer, and calling it Stalkolaris would’ve been too obvious. Man, this guy loves Andrei Tarkovsky. Garland’s second film, the follow-up to 2015’s Ex Machina, borrows liberally from Tarkovsky’s Solaris and Stalker and even cribs specific shots, like close-ups of seaweed underwater and alien flowers growing out of radioactive pools of colloidal liquid. He could do worse: I didn’t mind sitting through an obvious homage in a huge theater with booming speakers and a rapturous Sunday afternoon audience. Everyone was gripped by Annihilation, and if you can get a chatty, half-in-the-bag crowd to sit still and silent for nearly two hours, and not get any obnoxious moaning and groaning at the end when the credits roll and not much has been answered or resolved, you’ve succeeded. 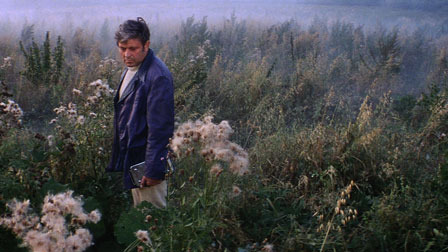 But beyond the unavoidable and often distracting use of Tarkovsky’s imagery, there isn’t much left to think about even an hour after leaving the theater because Garland’s film also recycles Tarkovsky’s ideas, and if you’ve seen Solaris and Stalker and read the books they’re based on (particularly Stanislaw Lem’s Solaris), very little of Annihilation will hold because you’ve seen it all before and already thought it through. 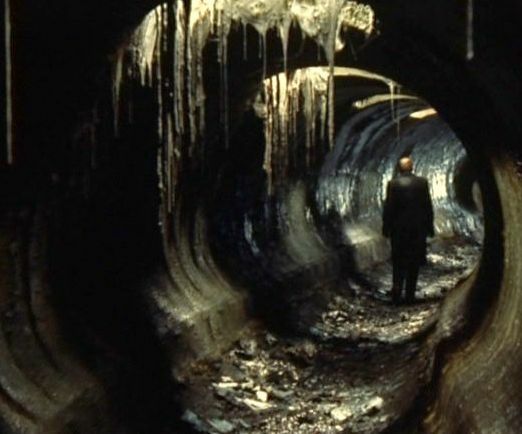 “The Shimmer” in Garland’s film, a mysterious and dangerous perimeter that no one has returned from and cannot be accessed with phones or radio waves, is just “The Zone” in Stalker and the massive oceans that cover the planet of Solaris. In both films, these areas are faceless but organic and intelligent, and they have the ability to manipulate human DNA: “The Zone” is a place that, once entered, will fulfill your “deepest desire,” which is invariably subconscious, unexpected, and unwelcome. The oceans on Solaris are able to read the minds and bodies of any human who approaches its orbit, and most of the film and Lem’s novel deal with cosmonaut Kris Kelvin and the apparition of his long dead wife Hari. She’s real and identical in every observable sense to Kris, but nevertheless a simulacra, and one who eventually realizes she’s a copy, a bootleg. Kelvin obviously wants to hold onto faux-Hari at first until his co-pilots and colleagues convince him of the ethical implications of forcing a conscious being to act out a fantasy life and play a role she never asked for. In the film, Kelvin ends up marooned on an island in the middle of Solaris’ massive ocean, living out his youth and better days with his father in a degraded, broken down version of his former reality. 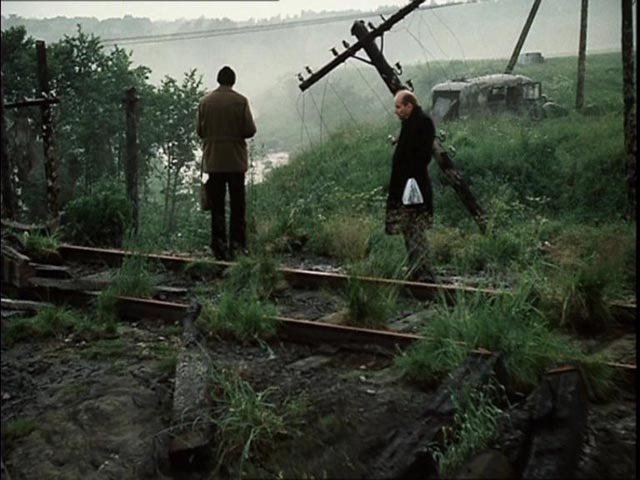 Visual references to Tarkovsky abound in Garland’s film, and the conceit of a band of people with nothing left to live for venturing into a “zone” that’s either deadly or transcendent or both is ripped wholesale from Stalker. Just look at these stills: Kris Kelvin in Solaris, Josie Radek in Annihilation. Standing around in Stalker, rowing in Annihilation. Reaching the center of their respective “zones” here and there. I realize that most of this comes from VanderMeer’s novel, but as someone who’s seen the Tarkovsky movies, Annihilation didn’t leave me with much to chew on. As if the abundant visual references and rip-offs weren’t enough, the ending of Annihilation is posed as a reveal but is nothing more than the central thesis of Solaris: characters played by Natalie Portman and Oscar Isaac face each other, finally reunited after more than a year apart, both profoundly fucked up from their experience in the Zone—I mean, the Shimmer, and Portman’s character asks “Are you my husband?” Isaac responds: “I don’t think so.” He asks the same of Portman, and she says nothing. When they embrace, the color in both of their eyes dance, showing that these are mutated forms of past organisms since annihilated. Convincing simulacra but inauthentic nonetheless. I liked the movie a lot, and I imagine someone who’s never seen any of Tarkovsky’s work will be thrilled, but for most of Annihilation’s nearly two hours, I felt like I was watching a remake that no one asked for.